Some Santharian goodies , brought to life. 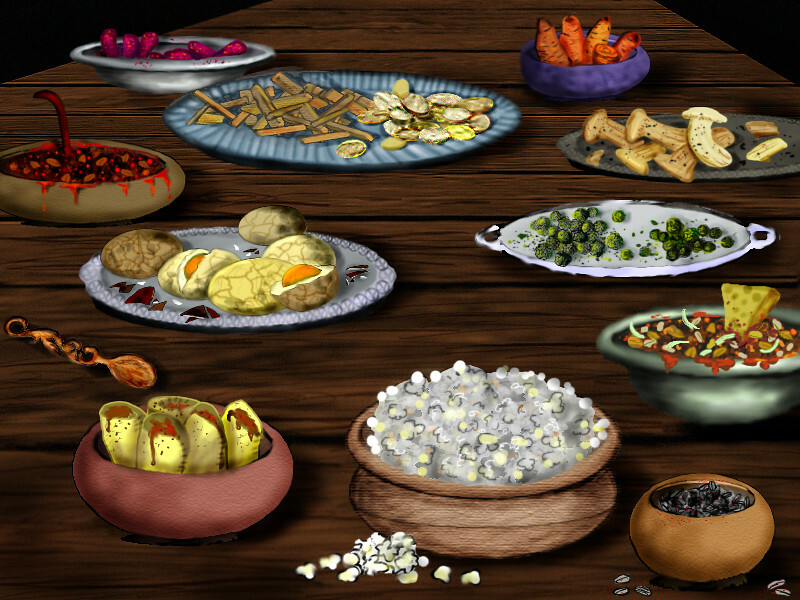 I noticed that Art had carefully put my Petitioners and Seeker's Doch Nut illustrations into the little circles in the Overview.... http://www.santharia.com/food_and_drinks/snacks_of_santharia.htm but that only made the other little circles look woefully empty (dare I say, hungry?) by comparison. Moving widdershins around the table, beginning with the popped Bredden grains at the bottom centre, we see some of the most popular and delicious snacks available in the Santharian Kingdom. Next to the popped grains are some rolled Thyslan Spice Cakes. One can see the sugared nut filling oozing from their centres... Above them are the savory Drake’s Eggs, which have been boiled in cha’ah to give them their flavor and colour. Next comes the very spicy Jhelhee dip, which is often served with the following snacks; Timbers (deepfried tuberroots sliced into long logs) or Crispies (also tuberroots fried, simply cut into ovals). We can see them on the blue platter at the top of the table. Let us not overlook the beautifully coloured Hearthberry nuggets, peppery and tangy, to their left! To the top right of the table are the roasted yamtubers, a very simple but flavorful snack which is popular in the winter. The Thergerim are responsible for inventing the next snacks; Shrooms and Koekenchips, both made from mushrooms - but they are now a favorite of many races! We see some crunchy Oya Nuts (actually spiced dried peas), looking as though someone couldn’t resist stealing a handful already, and just below them, the famed Northman’s Pot, a spicy bean stew with cheese and weeproot. Last, but definitely not least, in the bottom right corner, the wonderfully salty Sunseeds take their place. Truly, a bounty of snacks that would make any hobbit begin to drool, or as they say in the North, would tempt an orc to turn peaceful! Aura +1 for this tasty contribution! The chips might need a little adjustment yet: their edges are too conspicuous... but in the meantime there are quite a few other foods that can be circle-cropped and added into the overview! Will fix that later: bedtime for now. This is great Judy. I would suggest that we not be too picky on the picture details as these are really just going to be used for the circle pics and each one will not be that large. So from me I say just clean up what you want, the edges as you said, and lets see this integrated. This is really great Aura +1 from me. My favorite are the savoury drake eggs and the thyslan spice cakes. Yum yum. However, AFAIK the honey slyggs are NOT listed in the Snack overview, so I think you'll have to take that up either with Dame Sausade or our webmaster and sage! An edited version of the Snacks is available here, for our webmaster's convenience! Why am I sitting here in a cafe and am eating Greek salad on soggy white bread? I want bredden popcorn! I want drake's eggs! Aura. Brilliant picture, and lovely description, too. "Widdershins" - nice word! Moving widdershins around the table, beginning with the popped Bredden grains at the bottom centre, we see some of the most popular and delicious snacks available in the Santharian Kingdom. Next to the popped grains are some rolled Thyslan Spice Cakes. I love your description, Judith - but I noticed one detail: your description doesn't actually move widdershins around the table, for widdershins is counter-clockwise (against the apparent direction of movement of the sun, as I learned from the Oxford English Dictionary), whereas your description takes the clockwise direction. "Mowickle-wise" (which would be one possible Santharianization) seems a bit laboured as an expression. Maybe you could say "moving around the table as sun and moon around the disk" (for on Caelereth, both sun and moon move 'clockwise' - the sun from East to West in the South, the Moon from West to East in the North)? But then again, I'd miss the lovely "widdershins" if it was removed from the text. Maybe you've got a better idea? Thanks for the final version, Judy! Will be added soon to the overview to complete it. As far as I can see the remaining three meals indeed on the picture cover the complete current Snacks overview and we'll have everything illustrated on this page, providing a smashing example on how a complete overview should look like! Wonderful! Shabakuk has a point with his "widdershins" comment BTW! Seems he got that one right... Anyway, the other thing is that the picture as a whole including the very detailed description is still looking for a place on the site. Because putting it in the overview isn't very effective if everything is added below again once more. Any entry dealing with a feast where we could put it? Or a part of an entry that deals with a feast? Would be nice to have the whole thing somewhere! Oh, and before I start, Judy, you seem to Americanise "flavour" and all the "-our/or" words except for colour, which you spell correctly in the English British manner. Anyhow. And on that delicious note, goodbye. I'm off for a snack. I'd say that calling it English and not British would be correct, considering that we Australians also use correct, and not bastardised, English. Google Chrome even tells me that I spelled "bastardised" incorrectly there. Hah. Stupid Chrome. True...but it sounds vaguely colonial I suppose you would say that Aussies use British English. But anyhow. It is not English ... it is bloody Australian ... in the words of one famous Aussie. Contractions, contractions! "It's", it is. We Australians are lazy in our pronunciation, you should know this! In fact, despite my love of language and proper grammar, I'm extremely lax when I speak. I sound really ocka, too. And I'm a tiny bit of a bogan sometimes. I like to think of myself as an "urban bogan".